Many thoughts pass through our minds every day. Some thoughts are innocent. Some thoughts are good. Some thoughts are sinful. Other thoughts are destructive, such as worry, fear, discouragement and discontentment. However, the most pleasurable thoughts are upon Our Lord and Savior Jesus Christ. How often have we spent a day with very few thoughts upon Jesus? Yes, we pray, but are we meditating upon Jesus? Yes, we read our Bibles, but are we meditating upon Jesus? The Psalmist shares his experience of meditating upon Our Lord. He describes this experience as “sweet” Why would the Psalmist use this word? Why doesn’t he use the word “uplifting” or “blessing”? The Psalmist uses the word “sweet” to describe the pleasure He derives from His meditation upon the Lord. He shares that there is no greater pleasure in this life than to meditate upon the Lord. He wants us to join him in this sweet time of meditating upon the Lord. The word meditate has the idea of contemplating or focusing upon with all of our mind. Our mind is often going in several directions at the same time. We live in a society of multitasking; however, when we multitask in our meditation of God, the sweetness disappears. Our awareness of God’s presence diminishes. The pleasure is gone. 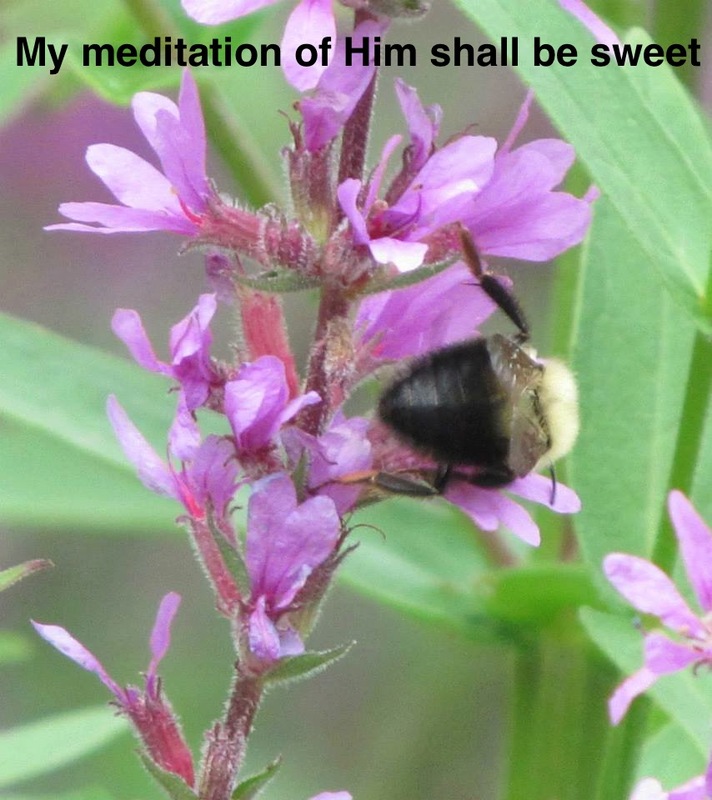 What makes meditating upon God a sweet experience? 1. Meditation upon God develops an intimate relationship with Him. Can you imagine if we were to walk in the sandals of Enoch, Noah, Abraham, Joseph, Moses, and David? These men knew the God they served. They enjoyed His presence. They enjoyed His love. They enjoyed hearing His voice. They enjoyed seeing Him work in their lives. They confidently talked with God because of this intimate relationship with Him. 2. Meditation upon God increases our faith. One of the greatest struggles in our life is the struggle of faith. We walk by sight and our own wisdom instead of walking by faith. Our struggle with faith occurs because of our ignorance of God. The more we meditate upon God, the more we will know His attributes and His promises. This knowledge will help us to put our confidence in Him. 3. Meditation upon God changes our focus from ourselves unto God. We have the habit of viewing life through our own eyes. Our focus often becomes self-centered. We become filled with the “selfs” of life, such as self-pity, self-centeredness, self-glorification, and self-gratification. When self becomes the focus, joy leaves our lives. However, when we develop the habit of meditating upon the Lord soon our focus will change from self to God. 4. Meditation upon God gives perspective to our trials, heartaches and suffering. Life is filled with tribulations. We feel hopeless in the midst of a deep trial. What can we do in the midst of this great difficulty? When we meditate upon God and His promises, we see His strength, power and love. We understand that no matter how great the difficulty, God is greater than any trial that comes our way. The disciples had to learn this lesson often. However, David when he faced Goliath, he had great confidence because He had the habit of meditating upon God and His Word. Meditating upon God means that we take the time focus upon His person. Here are a few ways that we can enjoy the sweetness of meditating upon God. Meditate upon the attributes of God. Perhaps, every day focus upon one attribute of God. This will enable us to find sweetness in every one of God’s attributes instead of focusing on only two or three of His attributes. When was the last time we meditated upon the immutability of God, or the jealousy of God? The more we know who God is, the sweeter He will be to us. Meditate upon the works of God. The Bible is full of God’s work in the lives of people as well as nations. We see God’s wisdom, power, justice, power and love flow through the deeds that God performs throughout the Word of God. Meditate upon the promises of God. We become discouraged and worried because we have forgotten God’s promises. In Pilgrim’s Progress, Christian finally escapes the Castle of the Giant Despair when he remembered the key in his bosom that opened every look in Doubting Castle. This key was called “Promise”. Meditating upon God’s promise helps remove doubts that haunt us quite often in this life. Meditate upon the names of God. The Bible is full of various names of God. They are like beautiful jewels waiting to be discovered.